I’m not much of a tattoo guy, but they are much nicer to take in when the canvas they are on is pleasing to the eye. On the other hand, go to a water park and be prepared for a horror show. Marc just keeps it coming! Here’s the latest young version of an old hero you’ll be seeing in Chapter 15 – Atomic Fly! 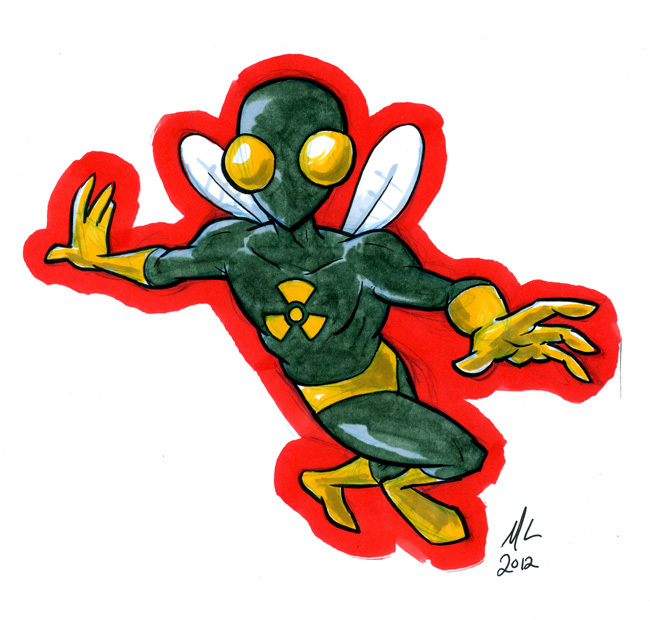 Atomic Fly was just your normal, everyday, average trapeze artist/law student when he was bitten by a radioactive fly. That didn’t do much besides make him sick for a month, but during his care at the local hospital, he met Dr. Strangecove, janitor at Mercy General and part-time mad scientist (the “Dr.” is more of a self-appointed honorific)! Disappointed by the patient with the fly bite’s lack of transformation, he set out to do what happenstance could not–make a human fly! To everyone’s surprise, he was entirely successful (never judge a janitor) and soon Atomic Fly was born. With his mighty wings and abundance of eyes, he soars the sky looking for rights to wrong–and always finds them! Now, older and worn out, but still full of humor, Atomic Fly prefers to hover around Valhalla aimlessly, staying upside down as much as possible.